Let our team of medical experts help you reach your ideal bodyweight with a plan personalized for you. Why Bariatric Surgery and a Weight Control And Wellness Program? More than 35 percent of adults are obese. Obesity has been clinically classified as a disease by the American Medical Association and for good reason. Obesity can reduce both life expectancy and quality of life. If obesity rates continue on their current path, it is estimated that the number of new cases of Type 2 diabetes, coronary artery disease, high blood pressure, stroke and arthritis could increase 10 fold by 2020. Some of these conditions can be controlled or even cured by treating obesity. Hiram Gonzalez, M.D., is a dedicated general/gastrointestinal surgeon at Monongahela Valley Hospital. He works in Belle Vernon and Finleyville with general/gastrointestinal surgeon Arshad Bachelani, M.D. Dr. Gonzalez is a fellowship-trained bariatric surgeon, who has extensive experience with weight management programs. Whether you choose bariatric surgery or not, Dr. Gonzalez and the team's goals for you are to lose weight, live a longer life and enjoy a better quality of life. 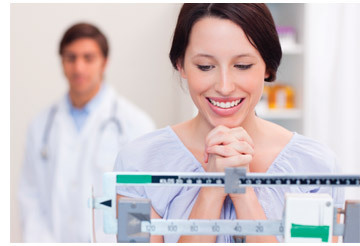 The program offers different weight management strategies until we find one that works for you. In some cases, the answer may be weight loss surgery, called bariatric surgery. Dr. Gonzalez performs the three most common bariatric procedures: the adjustable gastric band, the gastric sleeve, and the gastric bypass. Each has its advantages and reduces or restricts the stomach, causing a patient to feel full sooner and to eat less. The procedures are quite safe and the risks are low. All procedures are minimally invasive, using small openings in the skin. Adjustable Gastric Band uses a small band to create a small pouch that restricts food allowed into the stomach. The band needs adjusted periodically. This is the least invasive of the surgeries, with no cutting, stapling or re-connecting of the stomach or intestines. Gastric Sleeve (Vertical Sleeve Gastrectomy) surgically reduces the stomach to 1/15th of its original size, about the size of a small banana. Roux-En-Y Gastric Bypass surgically reduces the stomach size to a one half-ounce size pouch, and connects the small intestines directly to the pouch. Who Qualifies for Bariatric Surgery? What About my Primary Care Physician? This program does not replace your primary care physician, but works in concert with him or her. MVH's Weight Control and Wellness Program will help you attain a more healthy lifestyle so your PCP can better manage the medicines you need for diabetes, acid reflux, high blood pressure, etc. Patients who lose weight often see decreases in or elimination of these medicines. Will my Insurance Cover this Program? It is important to check with your insurance carrier to determine if they cover the aspects of the program listed to the left. How does the MVH Weight Control and Wellness Program work? If you have 100 pounds or more to lose, you know that your weight did not appear overnight. It will take time, effort and lifestyle changes to eliminate your excess weight and to keep it off. But there are often multiple reasons for severe obesity, a disease that stores excess energy as fat in the body. For more information, contact the office of Dr. Gonzalez at 724-929-4122 or visit his Web site. Come meet Surgeon Hiram Gonzalez, M.D., at these free information sessions to learn how weight loss surgery can help those struggling to lose 100 pounds or more. Reservations required by calling 724-258-1333. If you are interested in the Weight Control and Wellness program, but are unable to attend one of our free information sessions, click here to fill out the request form. You will receive an e-mail with a link to a recording of Dr. Hiram Gonzalez's "Is Bariatric Surgery Right For You" and a PDF containing information from the talk. Despite its many advantages, weight loss surgery may bring about challenging times in your life and there might be times when you need encouragement and advice from people who have been in your shoes. This is why Monongahela Valley Hospital has started a Bariatric Support Group. For more information, download the PDF.